Kelley Insurance Agency offers Automobile Insurance Discounts for Good Drivers, Non-Smokers, Good Students, Senior Drivers, Multiple Car Discount, Auto/Home and Educational Discounts such as 55 alive and Youth Education and Safety courses. We offer Automobile insurance coverage for the State Law Minimum Liability Insurance requirements as well as Full Automobile Coverage Insurance. We can provide insurance for your Cars, Trucks, Motorcycles, Campers, Boats and Sport Cars. 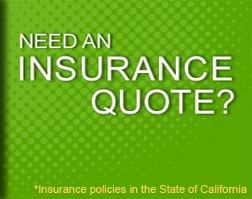 We welcome your insurance quote request. An agent will review your information, and contact you soon after reviewing your provided information. However, if you have any questions, please call us at 818-735-4959, Monday thru Friday, 9 a.m. to 6 p.m.
Bodily Injury: Pays claim against owner if someone is killed or injured and owner is at fault. Hospital and Doctors Bills. Legal Fees, Court Costs, Loss of Wages. Required in many states. Needed by all car owners. Minimum coverage required is generally too low. Limits listed are in $1,000 increments. i.e. 15/30 = 15,000/30,000. Property Damage: Pays claim against owner if property of others is damaged and owner is at fault. Other car and possessions in car. Damage to home, telephone pole, and traffic light. Required in many states. Needed by all car owners. Uninsured Motorist: Pays for injuries to you and your passengers resulting from the negligence of an uninsured motorist or a hit and run driver. Hospital and Doctor Bills, Legal Fees, Court Costs, Loss of Wages, (Does not cover property damage in most states) Required in many states, but can be waived in writing. Needed by all car owners. Limits listed are in $1,000 increments, i.e. 15/30 = 15,000/30,000. Medical Payments: Pays medical costs for you and your passengers injured in any collision. Pays all immediate medical cost (generally in addition to other medical coverage.) This insurance does not require a legal process to determine fault, while bodily injury usually does. Comprehensive: Pays cost of repairing or replacing owner's car. Fire, Theft, Vandalism, Wind, Flood, Storm, Earthquake, Riots. Important for new or expensive car. Usually not needed for vehicle over 10 years old. Deductible is the out of the pocket cost to the insured. Higher Deductibles equal lower premiums. Collision: Pays cost of repairing or replacing owner's car when damaged due to an accident. Repair or replacement of any car driven by owner or with owner's permission. Important for new or expensive car. Usually not needed for vehicles over 10 years old or when value of car no longer justifies cost of coverage. Deductible is the out of the pocket cost to the insured. Higher Deductibles equal lower premiums. Towing: Pays cost of towing or minor repair to disabled car. Dead battery, Out of gas, Flat tire, Accident regardless of cause or fault. Good to have. Not needed if owner belongs to automobile club with towing service. Rental Car Reimbursement: Pays cost of rental car when vehicle is not drivable due to a covered loss. Cost of rental car or allowance while vehicle is being repaired from a covered loss or is stolen. Good to have if damaged or stolen vehicle is owner's only means of transportation. Reimbursement is usually made regardless if rental car is used or not.